OK, I'm on a roll now! I've actually finished tag 7 too but haven't got the light to photograph that one and I've got to prepare the studio table for tonight's scrap class! 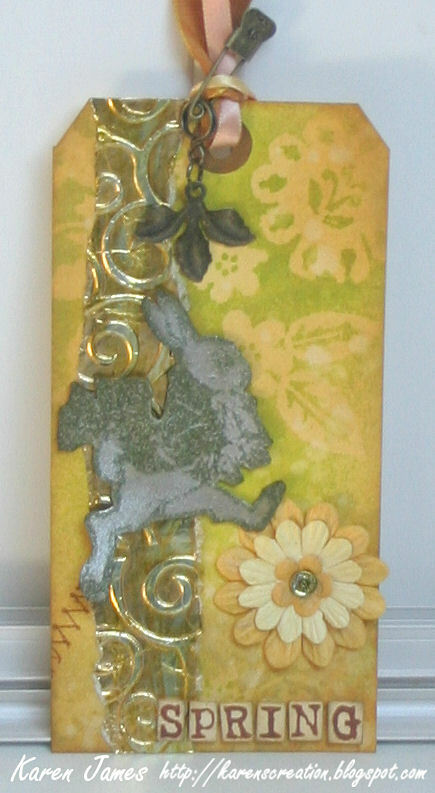 So here are 2 rather unusual tags: #5 with its alcohol ink and plastic background has a rather clean & simple look. 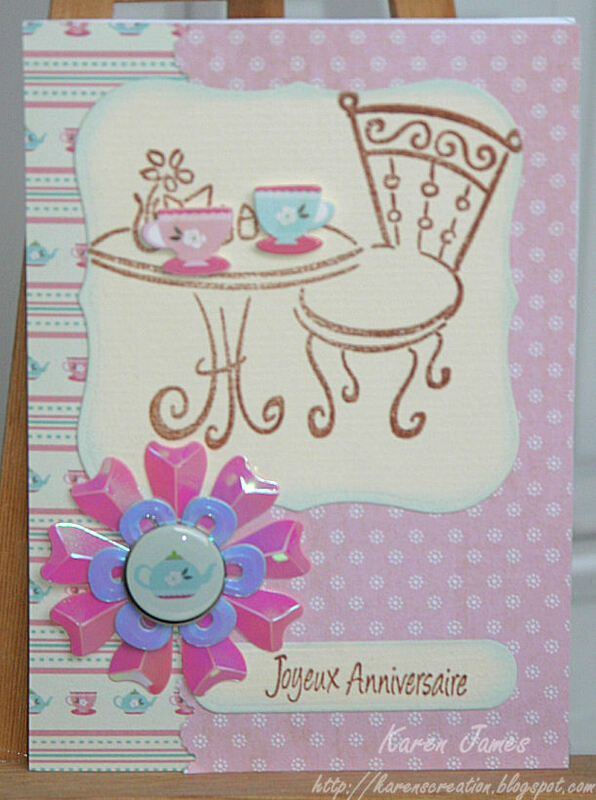 Tag 6 is metallic card, embossed, painted, sanded, inked and embossed with clear powder. You really need to go to Tim's blog to see the techniques explained - and his great tags of course - and you can believe him that you need to do the technique on tag 6 to see how good it is and that photos cannot do it justice! 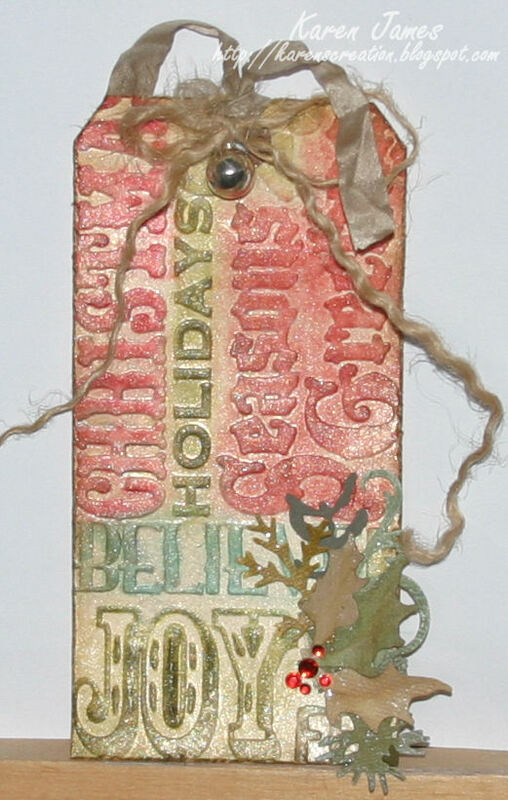 Materials: both tags: Sizzix 'Tag and Bookplates' die; for tag 5: Sizzix 'Festive greenery' die; adirondack alcohol inks: watermelon, terracotta, sunset orange; plastic packaging; white card, ribbon and pearls. Materials for tag 6 acrylic paints: Metallic card from PaperArtsy; retired cuttlebug folder 'Lace Tree'; acrylic paints (PaperArtsy, Ranger Studio and DecoColor); Dovecraft brad and flower; ribbon. 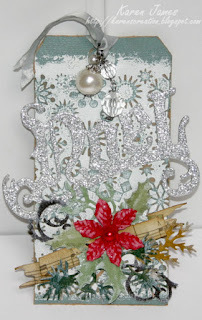 For this tag I used Tim's Christmas background embossing folder and inked over the raised words with different colours of Distress before giving it a good coat of Heirloom Gold Perfect Pearls Mist. 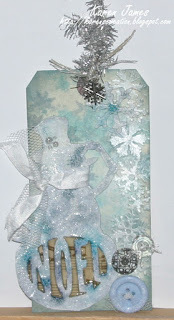 To get the different directions, I embossed the top part of the tag sideways then lined up the bottom half of the tag with the edge of the plates so it only embossed that bottom section and didn't put pressure on the part already embossed. 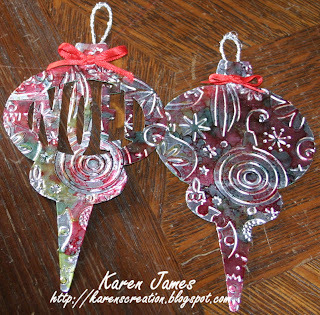 After that, a little arrangement of leaves from the Sizzix Strip die 'Festive Greenery' with some red bling for the holly berries, ribbon coloured with frayed burlap and some twine with a bell and I was finished! Tag 4 has a beautiful background, explained on Tim's blog, using Distress Stains (Picket Fence, Broken China, Weathered Wood) and stamped with Weathered Wood stain. 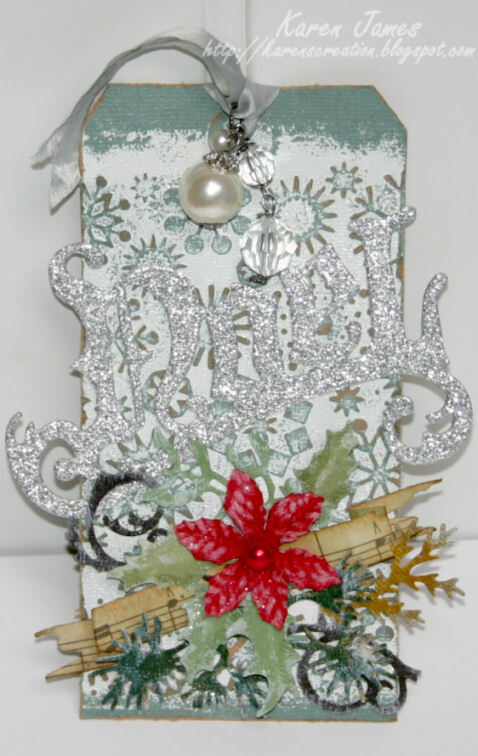 I then embossed the tag with the snowflakes border that comes in the Christmas background and border Texture Fades set and run Pearl Dabber over it to highlight the texture. The snowman is grungeboard cut with the Winter Wonder die and then the 'Noel' movers and shaper die, painted white and then with Rock Candy Distress Crackle Paint and coloured with the Distress stains. I stuck a scrap of Lost and Found paper behind him, decorated him with ribbon, tulle and a bit of bling and then stuck him on the tag. The snowflake from the Winter Wonder die got the same paint, rock candy, Distress stains treatment and was then stuck (top right) on the tag. 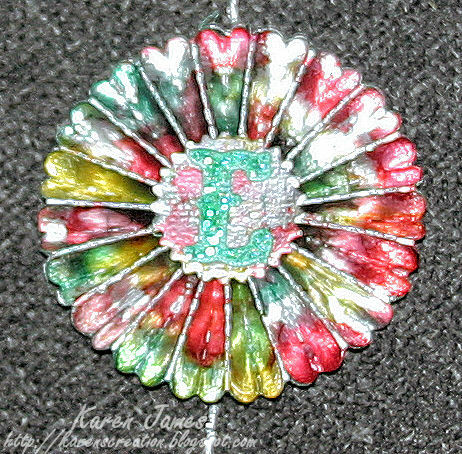 I added tulle to some buttons and stuck them down and then used tinsel, silver jute and a snowflake charm to decorate the top of the tag. 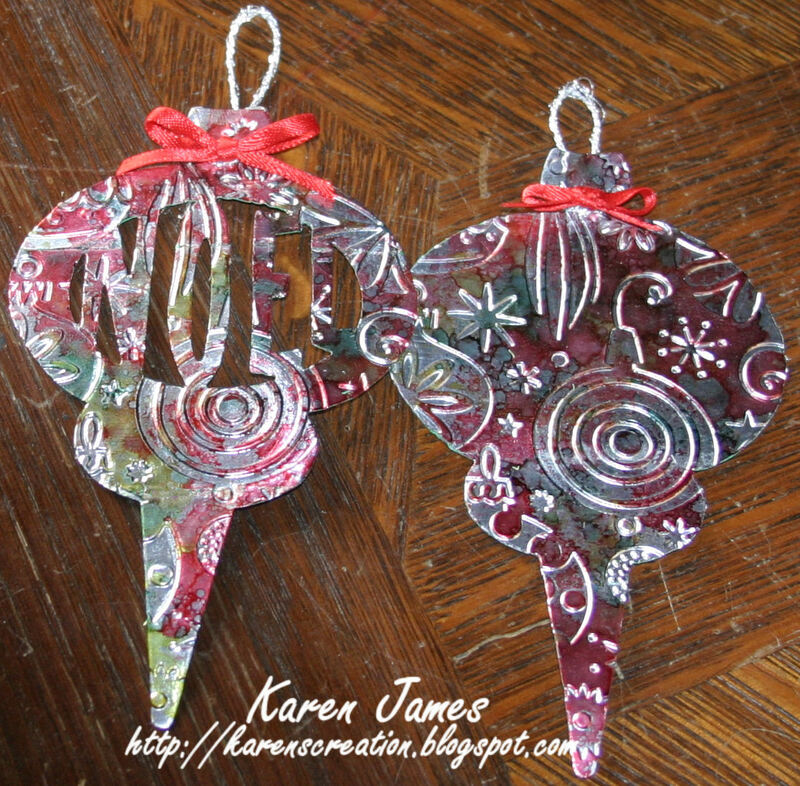 Finally, I filled the spaces in the Noel with Glossy Accents and left it overnight to dry. 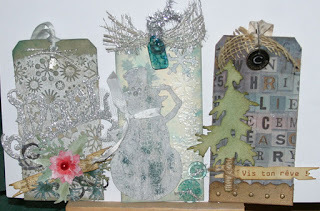 I wasn't late making these just slow to blog them... Have you seen Tim Holtz's fabulous tags this year? Still a few days to go: I love waiting for each one to appear. 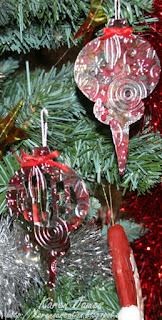 The first one features Tim's Kraft Core card, Sizzix 'Vintage Noel' die, Tattered Banners die, Festive Greenery die, idea-ology baubles, Distress Cardstock, Distress Inks, Distress Stickles, Lost and Found paper plus Snow Cap paint dabber, cuttlebug snowflakes embossing folder, white embossing powder, Prima poinsettia, red pearl bead and ribbon. Please see Tim's blog for the techniques involved. I really don't know what to call this: I just know I've been wanting to make one for ages and finally got round to having a play! First attempt, and I'm not a big jewellery fan, but I quite like it. The 'charm' materials are basically Tim Holtz idea-ology and some watch parts all held together with jump rings and glossy accents! The Grungy Monday challenge #21 to use Tim's Fragments links to 'Transparent Illusions' on his blog where he shares even more techniques using these. I have used three Fragment Charms: One glued with glossy accents on to some of Tim's Lost and Found paper, a second one glued on to a scrap of My Mind's Eye paper and embellished with an idea-ology metal foliage flower and watch part and the third one which is coloured on the back with alcohol inks (terracotta and copper) and embellished with watch parts. While the alcohol ink was pooled on the back of the fragment, I also dabbed some on the pin itself so it takes away a bit of the bright silver. 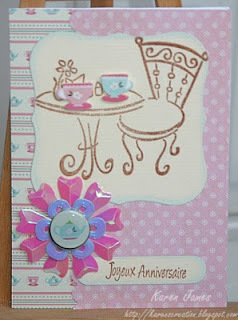 With the use of gears and watch parts I am also entering this in the Simon Says Stamp and Show 'SteamPunk' challenge. 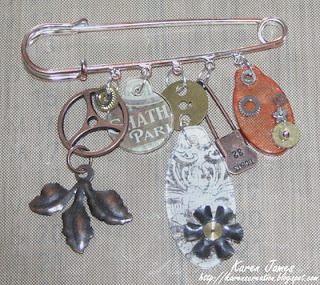 Materials: Tim Holtz idea-ology Fragment Charms, Sprocket Gears, Trinket Pin, Foliage, Lost & Found paper; Ranger alcohol inks and Glossy Accents; kilt pin, jump rings and watch parts. Here's another holiday snap (only another few hundred to go - lol!) scrapbooked with some handmade flowers so I thought I'd share the technique too: I started off by tying some thread through one seed bead, then threading on 5 more and taking the thread back through the first bead. Repeat this 4 more times (for a total of 5 petals), always threading back through the first seed bead, then tie off the thread. 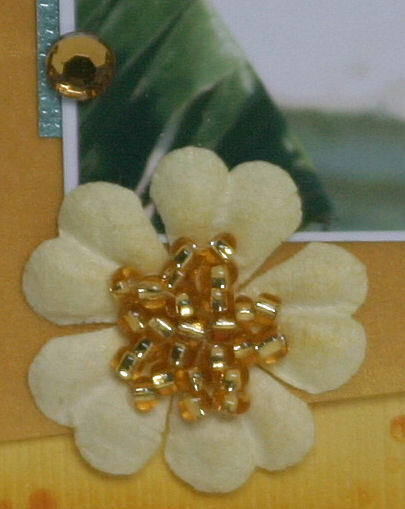 If you want bigger, more open flowers you can simply add more beads to each petal. Using thin wire as the thread is another good option. I've used the flowers here as the centres to paper flowers which I've inked a little with some Wild Honey Distress Ink. 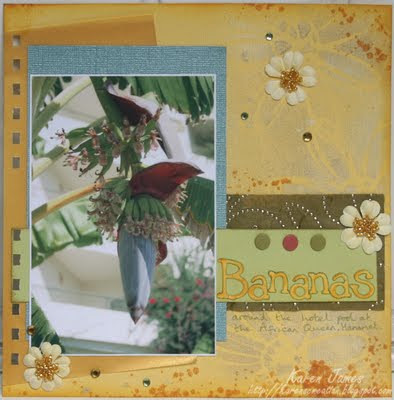 Materiels: Papers/ card / vellum by Bazzill, ColorCore and Clairfontaine; Distress Ink; Gold Cosmic Shimmer spray; Heidi Swapp mask; Sizzix Wingo Zingo alphabet; Prima flowers; Tim Holtz stamps (Bitty Grunge); WRMK snaps; gems. My delighted to say that two of my cards, made with Trimcraft (more usually known as Dovecraft) decoupage 'Fairy Cakes', have been featured on Aussie Scrap Source in their Inspiration weekend! It is worth having a look at the fabulous scrap pages the team have made too: They really are great inspiration. I'm also pleased to say that I have all the Trimcraft products featured in stock too! Travel - Intergalactic or Tunisia? So who knew parts of Star Wars were filmed in Tunisia??? 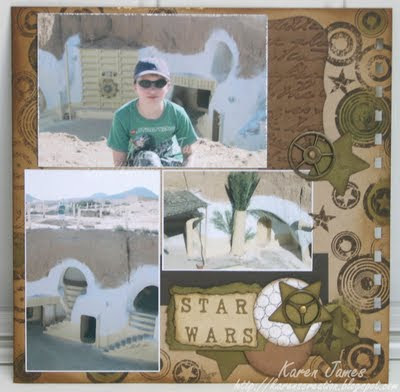 Not me, not until after we booked the holiday and started researching the tour sites: Wow, was my son excited when we found we were visiting two Star Wars film locations! 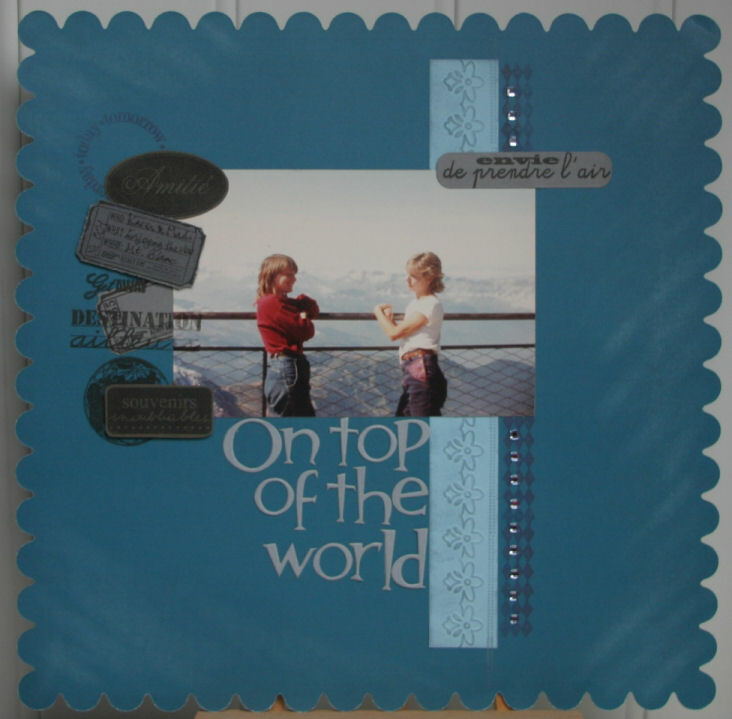 This week Simon Says Stamp and Show 'Travel' which is the perfect excuse for me to get started on scrapbooking my holiday photos! This 8x8" (20x20cm) page shows the place at Matmata where (apparently) Luke Skywalker's aunt and uncle lived until they were killed by nasty stormtroopers! In real life it is a troglodite hotel but they left the props in place after the filming was done. Of course, Jack had to wear his favourite Star Wars T-shirt that day! 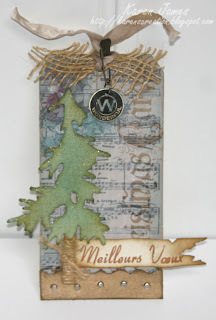 Materials: Bazzill kraft; Distress Inks (Vintage Photo, Walnut Stain); Distress Stains (Peeled Paint); Tim Holtz idea-ology: Sprocket Gears; Tim Holtz Stamps: CMS-089 Bitty Grunge Stamps; MSE alphabet stamps; Punches: Dovecraft star and circle; Spellbinders 'Labels 1' and embossed with Cuttlebug 'Script'; lots of scrap bits of card. Back from a fantastic week in Tunisia, I've made a tag to try to encapsulate our little adventure. I've made 6 for an exchange of Summer tags and I collected things to use while we were on holiday: the bottle cap, the charm taken from a necklace I bought there and real Saharan sand! The stamps were printed out and I was inspired by some art that I saw in Tunisia to have a go at metal palm trees! 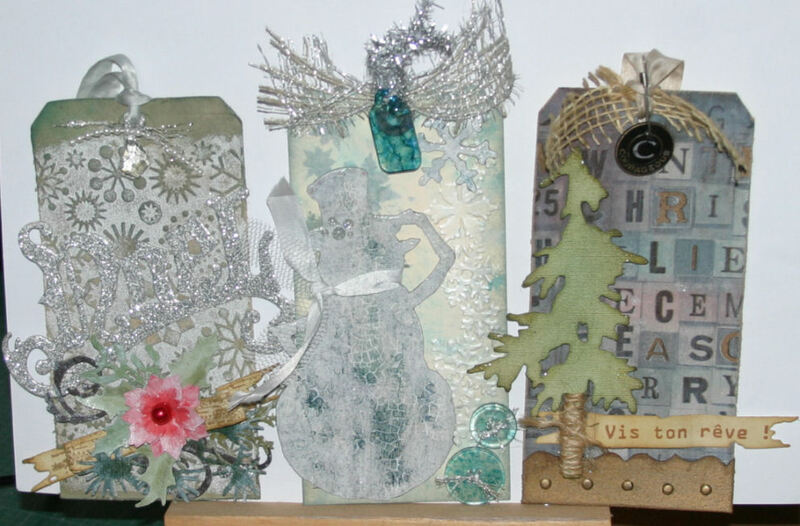 I've also incorporated the Grungy Monday #20 challenge - to use Tim Holtz' Distress Stickles - and the Simon Says Stamp and Show challenge - Bling. 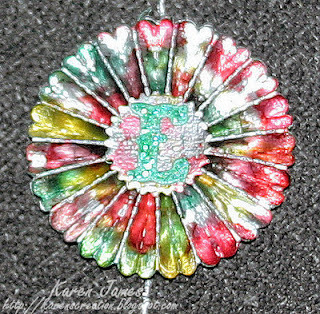 Well, if Distress Stickles aren't bling enough there is the charm and all that shiny metal so I hope that's covered?! You might need to look closer for the Distress Stickles: I've used the Rock Candy which is a lovely sugary texture and I made good use of it as a glue for the sand and then over-coated that in places to define the 'dunes' a little: Subtle but lovely sparkle. Tim Holtz - Ranger: Manilla tag; Distress Inks (Broken China); Distress Stains (Broken China, Wild Honey, Peeled Paint); Rock Candy Distress Stickles; Foil Tape; Alcohol inks (Bottle and Citrus) and blender tool; Paint Dabber (Pitch Black). Other: ribbon (coloured with Distress Stain), Ten Second Studio metal tools to create the palm tree. 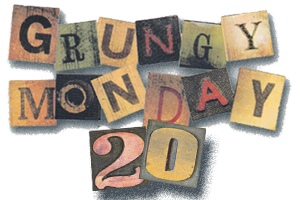 Grungy Monday 16, 17 & 18 !!! Ooops, been a bad blogger again!!! 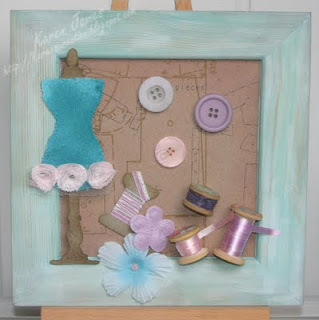 I've been crafting in snatches and not getting to blog, at least not in time for Linda's Grungy Monday challenges: Until now!!! Made it for #18 ! So challenge #16 was to use grungeboard/paper; #17 was to use Rock Candy crackle paint and #18 is to use this technique demonstrated by the genius himself, Tim Holtz. 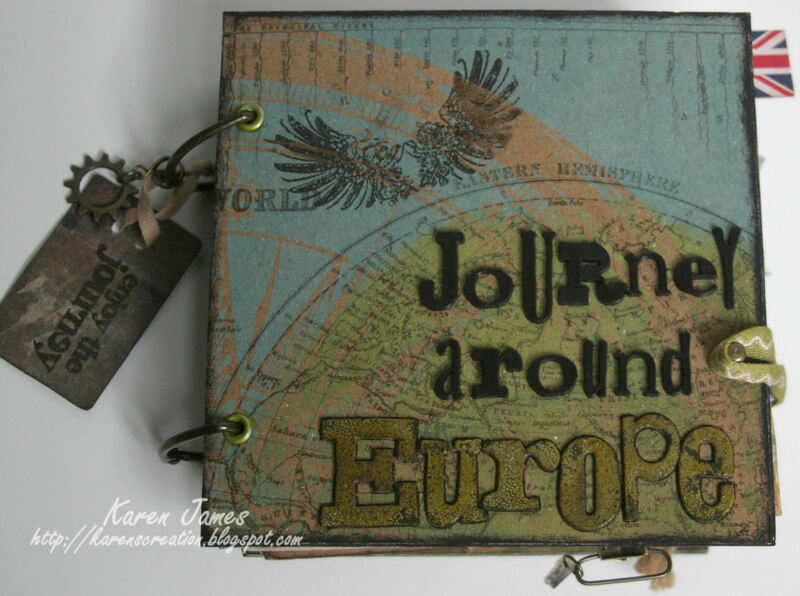 I have wanted to use Tim's Valise die to make a mini-book since he demo'd it back in January and here is my first: A little travel book for me to keep my notes and souvenirs as we travel around Tunisia for a week soon. I have made it general with lots of pockets and spaces for notes so that afterwards I can use all the bits I collect in scrapbooking the holiday and hopefully the little book will last for many more adventures to come. 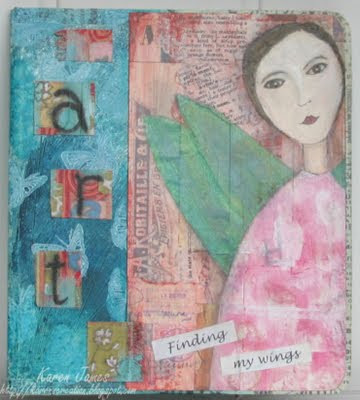 Stamps: Tim Holtz, Inkadinkado, Hampton Art. Je vous propose une journée à la fois bon pour la créativité, d’apprendre les techniques et pour l’humour. Nous faisons un album de bonne taille avec plusieurs poches et des étiquettes avec les nouvelles collections de JilliBean Soup. Ces collections sont pleines de fleurs et de papillons et nous travaillerons les plaques à découper et textures, les encres et les tampons. C’est un album avec plein de place à l’intérieur pour mettre vos plus jolies photos de voyage, enfance, printemps ou d’été ... à vous de décider! La journée comprend un super kit, toutes les instructions, convivialité et des gâteaux ! Pour avoir l'affiche détaillée avec l'aperçu, la liste des photos et des fournitures à prévoir, simplement laissez un commentaire ici avec votre adresse mail : Il ne sera pas vu sur mon blog mais je peux l’utiliser pour vous répondre. Pour l’instant, quelques places restent encore disponibles. 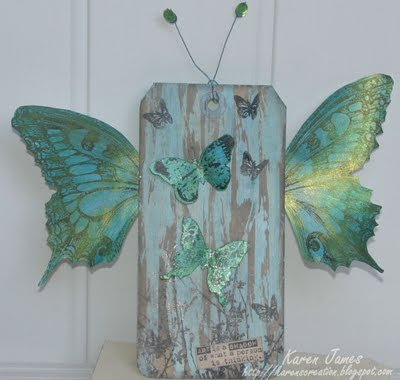 Butterfly tag with a twist! Not sure where I got this idea from, having the tag with butterflies also being a butterfly, but I just had to go with it so the text is very appropriate! 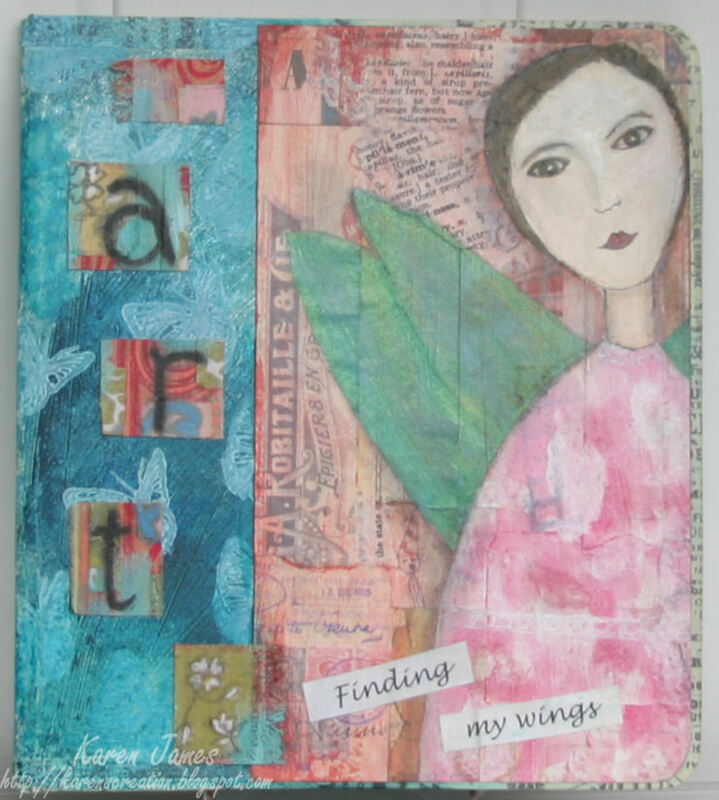 It is for the challenges Grungy Monday #6, Simon Says Stamp & Show (Anything goes) and PaperMinutes (Wings). 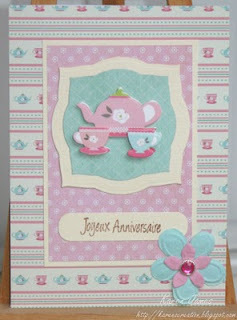 J’ai créé une étiquette plein de papillons pour les défis Grungy Monday #6, Simon Says Stamp and Show et PaperMinutes (les ailes). 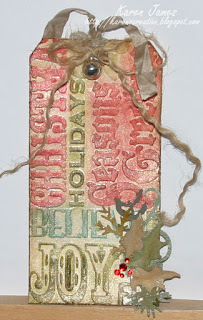 The Grungy Monday challenge is a technique demonstrated by Tim Holtz on his tag #8 from 2007 which I have used directly on the tag. Not having a suitable colour of paint dabber, I coloured some white acrylic paint with Stream ColorWash and applied it with a tooth brush! 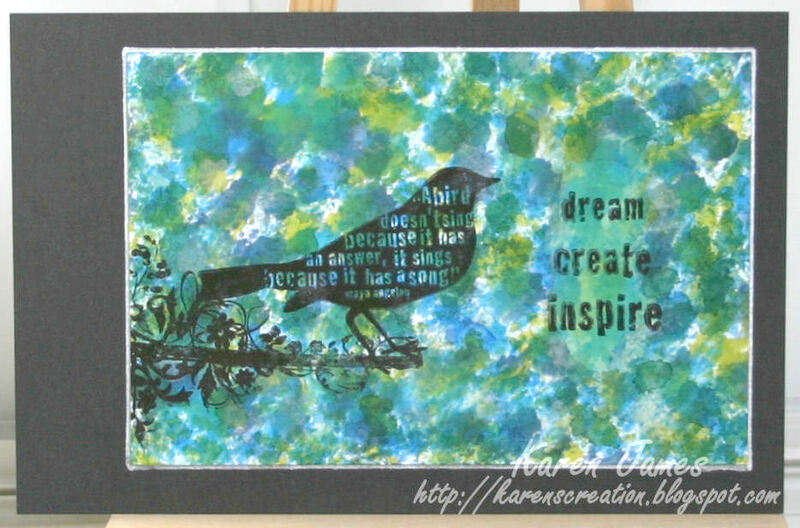 I then used pumice Stone and Black Soot Distress Ink. The large wings were printed on to card and painted with Lumiere paint, as were the little ones cut with the Sizzix Movers and Shapers Butterflies designed by Tim. 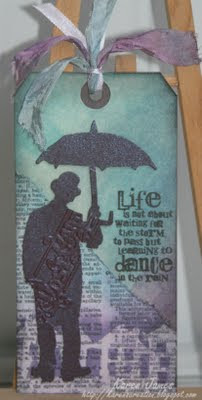 All the stamping is with Tim Holtz stamps and Black Stazon. Unfortunately the flash seems to have picked up a sheen on the ink but not the Rock Candy Stickles smeared on the small butterflies for extra sparkle. 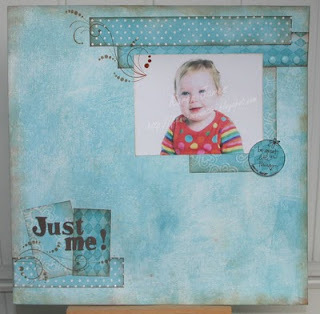 Le défi du Grungy Monday est d’utiliser une technique montré par Tim Holtz du décembre 2007. J'ai appliqué la technique sur l’étiquette, utilisant l’acrylique blanche coloré avec ColorWash ‘Stream’ et l’encres Distress en Pumice Stone et Black Soot. 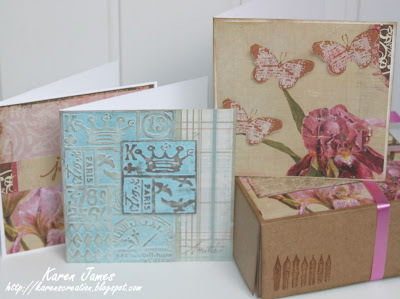 J’ai découpé les petits papillons avec le Sizzix ‘mover and shaper’ die dessiné par Tim Holtz et j’ai imprimé le grand papillon. Je leur ai donné une couche de peinture Lumière et du Stickles Rock Candy. Toutes les images ont tamponnées avec les tampons de Tim en la Stazon noire. 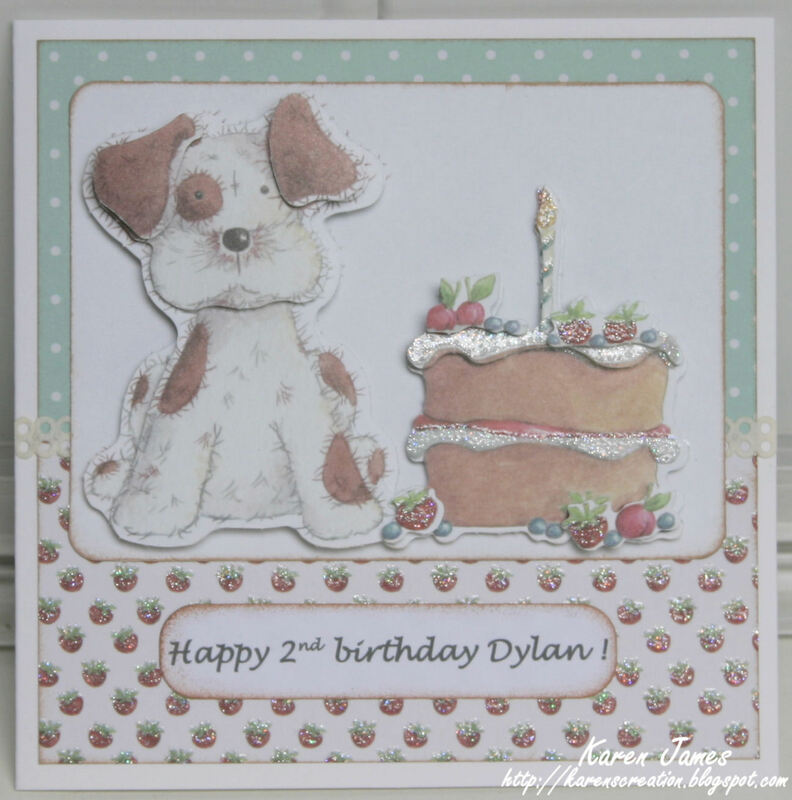 The white card base and layers are all coloured with Broken China Distress Ink: I used a brayer on the base and different resist techniques (paint on the flowers and clear embossing powder on the dots) and tone-on-tone (diamonds). I edged the pieces and page with Aged Mahogany for a bit of contrast and stamped with Sepia Archival ink. Stamps: Hampton Art, Inkadinkado. Title cut from foam with Sizzix alphabet. The photo isn't mine: It's a nursery photo of our grand-daughter but I don't know who to credit. 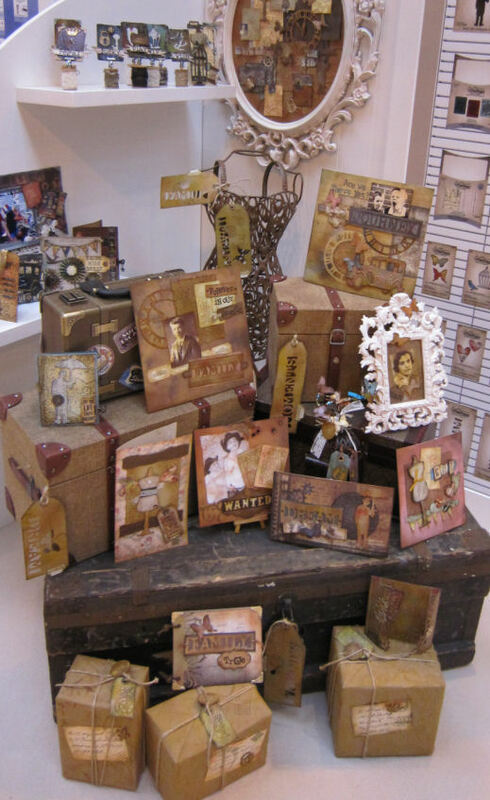 Thursday was the ArtsyCraft event: Met so many people, Tim Holtz included. 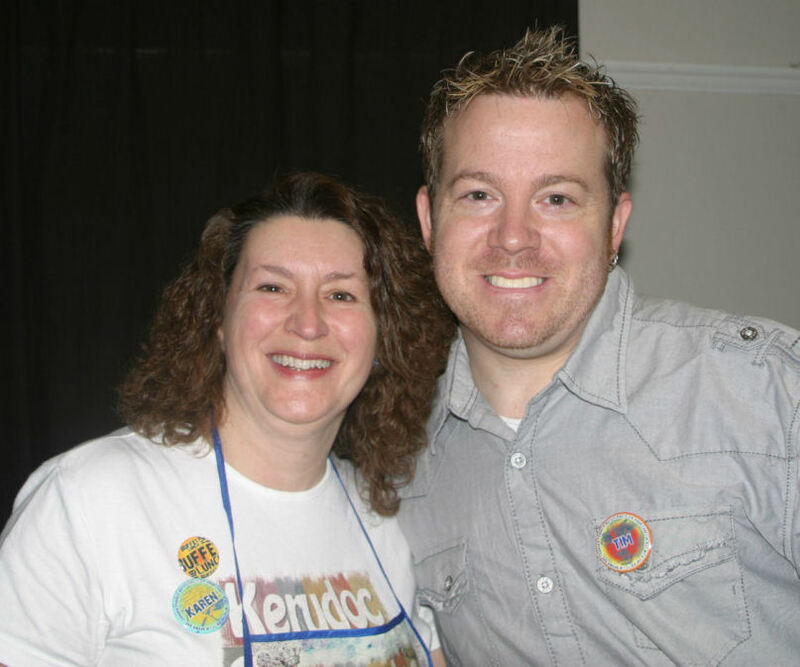 He was lovely, a great teacher and so patient with everyone's demands for photos and autographs. Mario, Tim's personal assistant, was just as lovely: I went to shake hands and got a big hug instead! We started a configuration box in Tim's class and received lots of goodies from Ranger and Tim, including some of the new idea-ology ranges. No photo yet until it is finished. 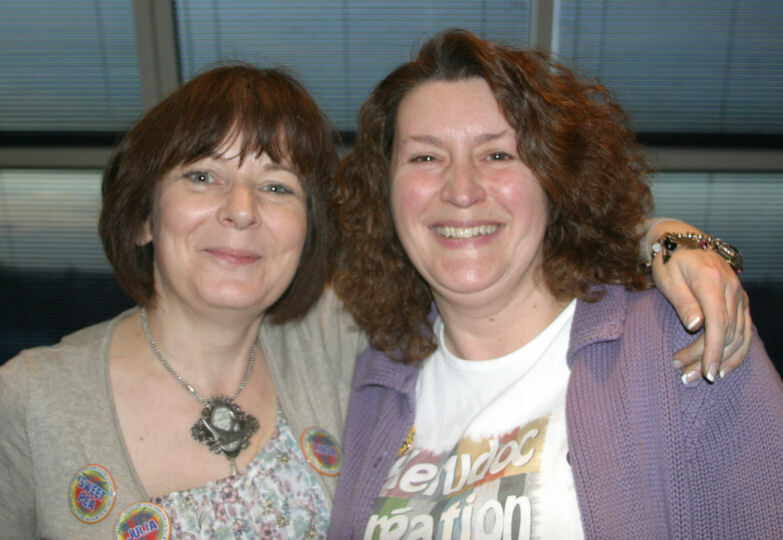 One of the best things was meeting people that I had previously only known via the internet but art brings you together: First photo here with the very talented Linda who has been a blogging buddy for some time. She is part of Lin's LB Crafts team who all worked like crazy on the preparation and to ensure all went smoothly on the day. 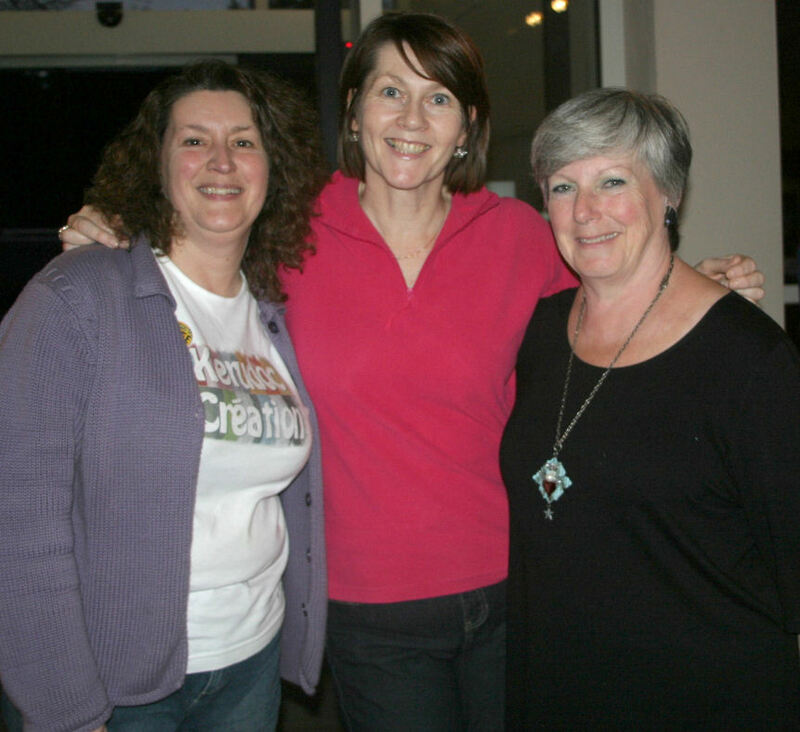 Second photo is with Sally and Bethan both of whom I have met on the All Things Tim Yahoo group, have exchanged emails with and was also delighted to meet. My only regret is that, in our art-filled day, there were some people I didn't get to meet or chat with. I look forward to the next time. 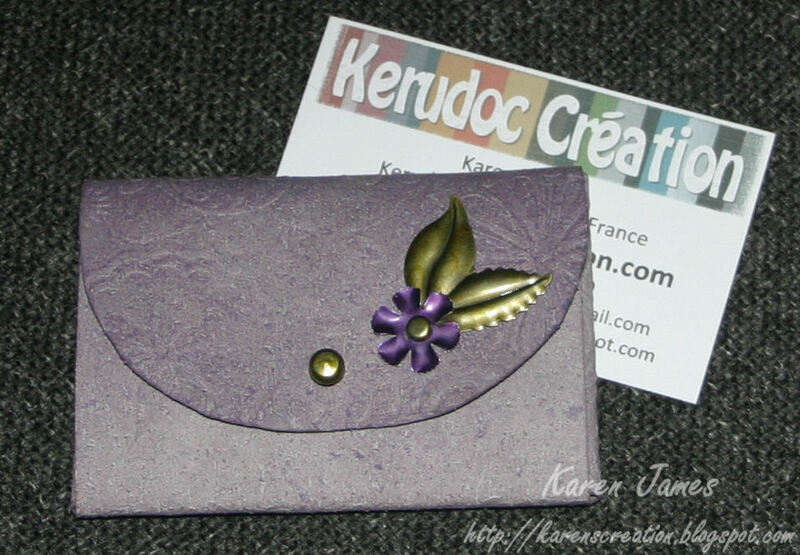 One of the many lovely people on the 'All Things Tim' yahoo group is the very creative Eileen who shared her template for making business card holders from Grungepaper. Thank you Eileen: I knew I HAD to make one: My business cards needed the protection and I just loved the idea. 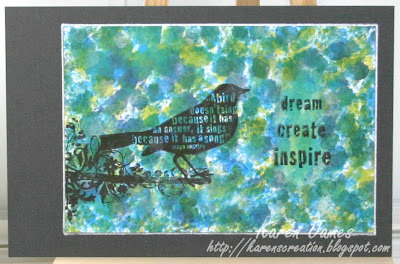 I want it to be able to take the use and abuse I am going to give it so kept the decorations fairly simple: I coloured the grunge with Dusty Concord Distress Ink, embossed it in the Cuttlebug (Floral Fantasy) and coloured some Tim Holtz idea-ology foliage and hitch fastener closure with alcohol inks. I love it! 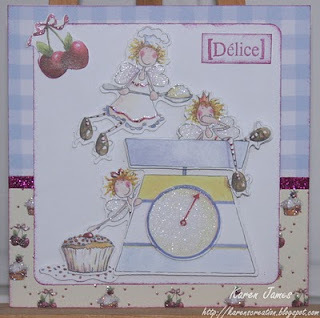 And, as the challenge on 'Simon Says Stamp and Show' is embossing, it is getting entered there too. 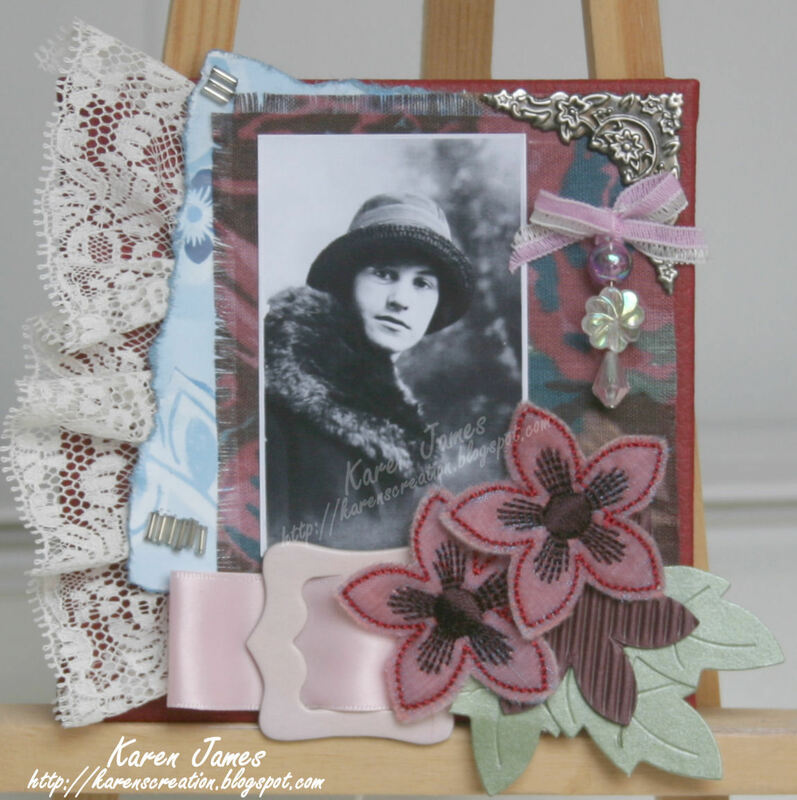 You can see more of Eileen's card holders here and here. That could be my future in that photo, stretching off in to the distance...You'll notice I haven't recorded the year! I'm the one in the red top, with my best friend Mads, at the top of Mt Blanc on a university field trip of France and Italy. Used: Cuttlebug embossing border and alphabet; Stamps by Tim Holtz, 4heures37, Hampton Art and Artemio; Versafine and ColorBox chalk inks. 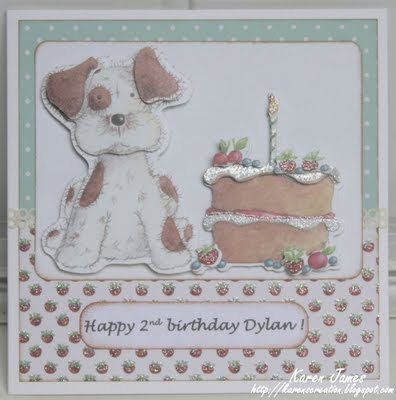 I've been asked to make some samples for a cherry fair in a local village so here are a few cards - they need to be quick to make so these pre-cut decoupage are ideal especially as decoupage is very popular here. 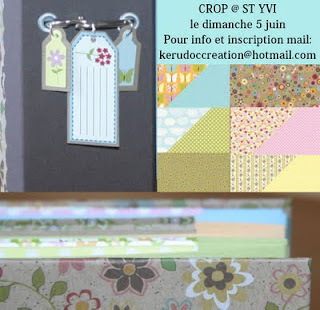 Ces cartes sont exemples pour la fête de cerisiers en juin (oui, en avance!). J'ai utilisé le bloc de découpage et papiers 'Fairy Cakes' chez Trimcraft, l'encre craie ColorBox 'Rose Petals', tampons d'Artemio et ruban. 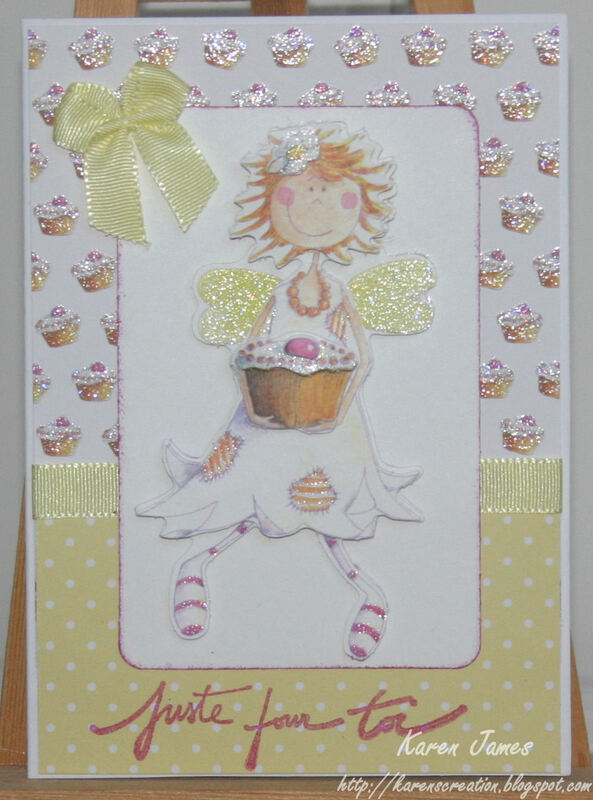 Both cards are made from the Trimcraft 'Fairy Cakes' decoupage and paper pack. 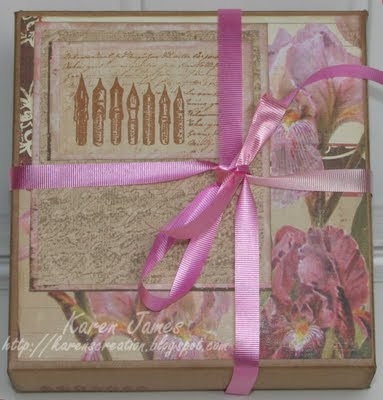 I added ColorBox Rose Petals ink, Artemio stamps and PaperMania ribbon and bow. 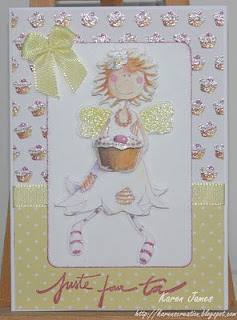 I'm entering these for the challenges on Cupcake craft 'Food for thought' and PaperPlay 'Layer it up'.